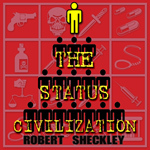 ROBERT SHECKLEY (1928 – 2005) An American author of Science Fiction, Sheckley won Hugo and Nebula awards for his writing. Over his long career he produced several hundred short stories and novels. He also took a turn as the fiction editor of OMNI Magazine. His clear and funny storytelling gained him a devoted following that appreciated his clever stories and novels. Intelligent satire, unpredictability, absurdism and humor marked nearly every story, even full length novels tended towards the humorous aspect of SF. His short story The Monsters stands tall as a classic of Science Fiction. It is a tale of first contact told from the alien’s perspective. By Robert Sheckley; Read by ??? Will Barrent has no memory of the murder for which he was convicted. He will now have to live his life sentence on the prison planet Omega. The few that survive there do it by committing crimes. And the more adept the planet inmates are at higher crime, the more they climb their bizarre anti-social ladder. They all must live in a society where drug addiction is mandatory, as is the worship of the Dark One. Barrent’s goal is to find why he was sent to this mad world and to clear his name and return to Earth. But first he must survive – for a life sentence on Omega is usually a short sentence indeed. 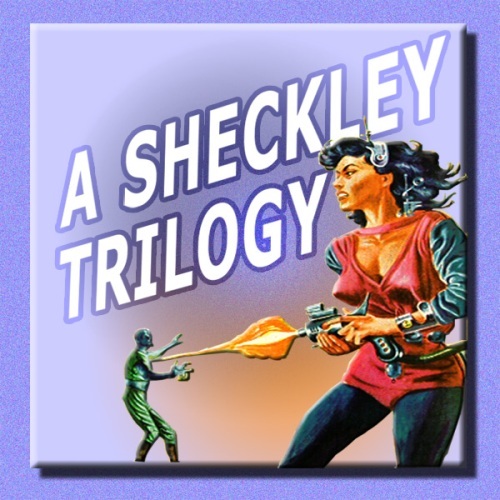 Robert Sheckley, master of the science-fiction short-story form, created numerous tales of dark humor. He had an entertaining gift for looking at society with a warped mirror, enabling us to see ourselves in a clearer reflection. Keep Your Shape” is from the perspective of an alien race with the unseemly ability to change shape. In “The Seventh Victim“, murder is legal and sanctioned by society, and the gunman’s victim is a beautiful woman. And when a spaceship filled with diverse alien life forms is stranded without a star drive, they only have one chance of getting home again. That chance is with a “Specialist” from Earth. These three works were originally published in Galaxy and The Magazine of Science Fiction and Fantasy in 1953. 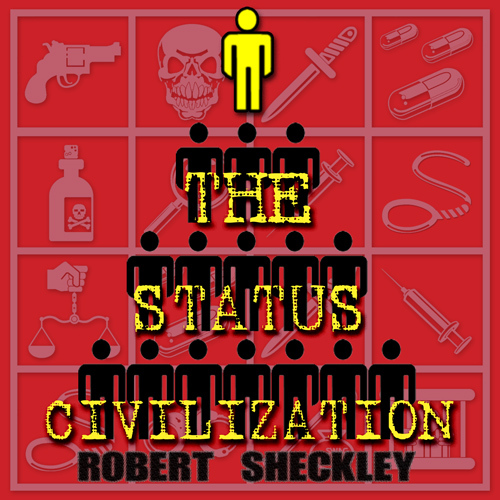 A six part series, the last of which was a short story “The Store Of Worlds” by Robert Sheckley. A race of strictly regimented, shape-shifting aliens feel compelled to invade and conquer Earth, but every scouting mission to our planet has disappeared without a trace. A squad of elite commandos is sent in find the answer. Science invents a flying robot that prevents murder, but there’s a fateful glitch. Adapted for audio by William F. Nolan and Ytzhak Berle, with a cast featuring Newell Alexander, Janet Carroll, Jerry Castillo, Joe Greco, Melissa Greenspan, Allan Miller, Stefan Rudnicki, Hamilton Camp, Brian Finney, and Bradley Schreiber. A science-fiction comedy series adapted and written for radio in four half-hour episodes by Chris Larner and David Gilbert. Starring Chris Larner, Mark Bonar, Trevor Cooper & Alex Rowe. Directed by Peter Kavanagh. Episode 1 – The mysterious deaths of space tourists on Planet Party gives planet decontaminators Arnold and Gregor a unique job opportunity. Episode 2 – London is melting! With the whole of earth blaming Arnold and Gregor, the planetary decontaminationists must flee, but where? 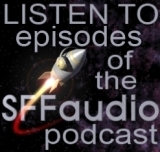 Episode 3 – Guilt stricken Arnold’s call home to apologise for melting Earth is traced. Our planetary decontaminationists are on the run. Episode 4 – Arnold and Gregor are about to be bombed senseless by Evans the Welsh vigilante, a fitting reprisal surely for melting Earth.